^ Ropp 1987, p. 329. ^ 2.0 2.1 2.2 2.3 2.4 2.5 2.6 2.7 2.8 2.9 Gardiner 1979, p. 297. ^ Ropp 1987, p. 358. ^ Alger 1907, p. 458. ^ Levine & Panetta 2009, p. 51. ^ Alger 1911, p. 283. ^ Windsor 1911, p. 653. ^ Guernsey 1920, pp. 179-180. ^ Halpern 1995, pp. 55–56. Alger, Philip R. (编). United States Naval Institute Proceedings 37. Annapolis, MD: US Naval Institute. March 1911 （英语）. Gardiner, Robert; Gray, Randal (编). Conway's All the World's Fighting Ships: 1906–1922. Annapolis, MD: Naval Institute Press（英语：United States Naval Institute）. 1984. ISBN 978-0-87021-907-8 （英语）. Levine, Edward F.; Panetta, Roger. Hudson-Fulton Celebration Of 1909. Charleston, SC: Arcadia Pub. 2009. ISBN 978-0-7385-6281-0 （英语）. Ropp, Theodore. Roberts, Stephen S., 编. The Development of a Modern Navy: French Naval Policy, 1871–1904. Annapolis: Naval Institute Press. 1987. ISBN 978-0-87021-141-6 （英语）. 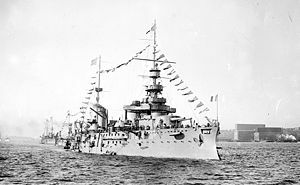 Trials of French Battleships Democratie and Justice. International Marine Engineering (New York, NY: Marine Engineering). November 1907, XII: 457–458 （英语）. Windsor, H. H. (编). French Battleship Blown up in Toulon Harbor. Popular Mechanics (Chicago, IL). November 1911, 16 (5): 651–653 （英语）. Alger, Philip R. (编). Trials of French Battleships Democratie and Justice 33. United States Naval Institute. 1907 （英语）.